The University of Bath, as part of the SETsquared Partnership, will be providing business accelearation support to companies through the ERDF funded Digital Innovation Business Acceleration Hub that are either resident or associate members of the new Bristol based VRLab. Support through the programme will be provided in a number of ways including grants of up to £10,000, knowledge exchange, mentoring, research and innovation expertise and resource, business-university research partnerships, as well as bringing SMEs together with large corporate businesses though existing investor networks. The Bristol VR Lab, was founded by the University of Bristol, the University of the West of England (UWE Bristol), Watershed and Virtual Reality Developer, Opposable Group, and aims to position Bristol as a centre of excellence and innovation of VR/AR at both a national and international level. The Centre provides a shared studio with high end VR, AR and 360 equipment available at all times, experts on hand to offer advice, and engaging industry talks and events on a number of subjects related to the field. The Bristol VR Lab will be hosting an introduction session for BVRL residents, members and associated early stage startups, to meet some of the organisations who will be providing business advice in the Immersive field. This is an introduction where you can hear more about the programmes and advice available, explain a little bit about your business, and then apply for each programme. 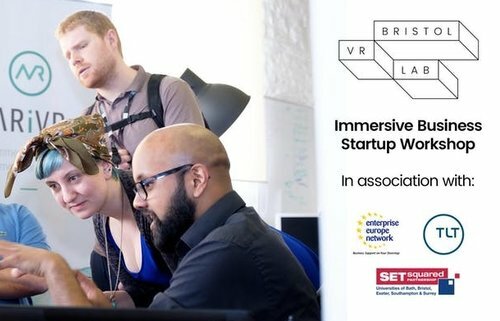 The Bristol VR Lab has put this group of programmes together as we feel it best fulfils the needs of the entrepreneurs working in this field in the region, particularly when used in combination together. Spaces are limited to residents and members of the Bristol VR Lab, or by invitation.